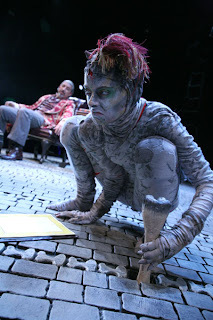 Screwtape the Play : Reform worship. It is pretentious of you to name drop...(Ooooo). Pretentious or not, I thought Max McLean was brilliant, (except for the way he said, "Your affectionate Un-CLLLLLLE SCREEEEEEWWWWWTAPhh"). I also loved what he had to say about Christians in need of creating culture, but more than that the fact that he is actually creating culture. Well-chosen quote. That is one of my favorite bits of Screwtape. The phrase "terrible as an army with banners" sticks in my head like a Christmas song heard far too early at the mall.